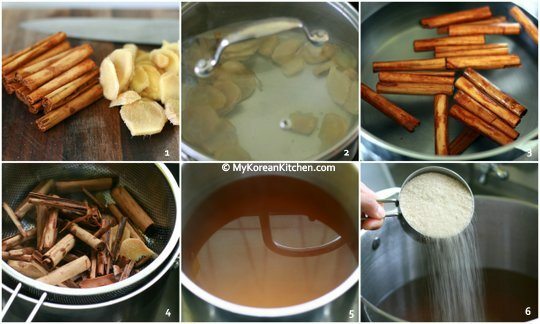 How to make Korean traditional drink, Sujeonggwa (Korean cinnamon punch)! 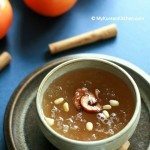 Today I’m introducing SuJeongGwa (수정과, Korean Cinnamon Punch), which I am sure you heard of before. 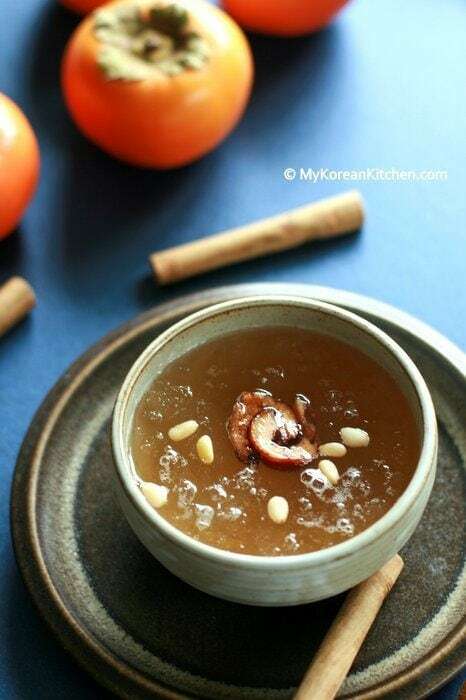 It is a popular traditional dessert drink along with Sikhye (Sweet rice drink). It is particularly consumed during the Korea’s festive holidays such as New Years Day and Moon Festival periods (Chuseok, also known as Korean Thanksgiving Day). It is known to help digestion and maybe that’s why it’s often served after having Korean BBQ at a restaurant. The punch can be drunk hot or cold, but I personally think cold is the way to go! It has a dark brown colour, though, as I added raw sugar instead of brown sugar, mine doesn’t look as dark as it could. The drink is sweet and the combined aroma from ginger and cinnamon sticks gives a warm feeling even though I am drinking it icy cold! 100g/3.5 ounces fresh ginger, skinned and thinly sliced. Put the ginger into a large saucepan. Add 11 cups of water, close the lid, then boil it on medium heat for 40 mins. At the same time, put the cinnamon sticks into a separate large saucepan. Add 11 cups of water, close the lid, then boil it on medium heat for 40 mins. After 40 mins, get ready another large saucepan (it should be large enough to hold the combined boiled water from step 1 and 2). Drain the boiled ginger and cinnamon sticks in turn through the sieve. (Discard the ginger and cinnamon sticks). Add the sugar into the saucepan (from step 2) and boil it for 10 to 20 mins further on high heat (or until the sugar dissolves completely). Sujeonggwa tastes best when served cold and I think it tastes even better if it’s icy cold. So as you can see from the below picture, after “express” cooling down the sauce pan (from step 4), I lightly freeze some punch (about 6 cups worth) in the freezer for 4 to 5 hours. Ice should be only lightly formed. However, if it is fairly firm, you can easily crush the ice with a fork. While it’s optional, adding the optional ingredients (pine nuts, dried chinese dates and dried persimmon) when you serve the drink will definitely enhance the flavour and scent. 100 g fresh ginger (3.5 ounces), skinned and thinly sliced. Please, please, pleaaaase make a sikhye recipe as well! 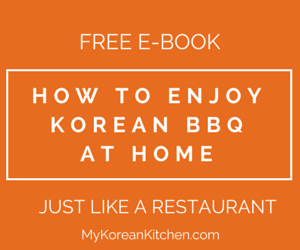 I love your recipes the most, I made salmon bulgogi and bibimbap recently – everyone in my family loved it. 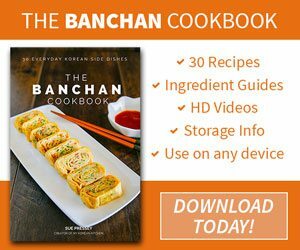 Korean cooking is spreading in Scandinavia now! haha. I recently made this punch and although i didnt follow this recipe, i used what felt like a good ratio of the ingredients. However, i dont know why i get this hard taste that makes my tongue feel rough and its a bit bitter and tart too. I used 5 sticks of cinnamon, a hand full of red dates, about 1.5 cups of ginger, 6 small dried persimmon, and about 20 cups of water. I boiled everything together for about 2 hours(my friend said her mother uses a slow cooker and keeps it there for hours). Im not sure where i went wrong. Please advise. Thank you. Hi Lily, I wouldn’t know the reason unless I make it myself exactly as you did. I don’t know who’s recipe you followed, it’s best to ask that person. Though I want to point out a few things. Typically you don’t boil the red dates (assuming they are dried?) and dried persimmons with the water. They are added when you serve the tea. Also ginger seems rather a lot compared to the water. Also I would add some sugar with it to make it sweeter. Anyway, that’s my thought. I made this tea a few months ago because I’d read elsewhere that it helps acid reflux. It did seem to help and now that I want to make it again I can’t find dried persimmons which it says all over the Internet that this and ginger are the ingredients that help the reflux. 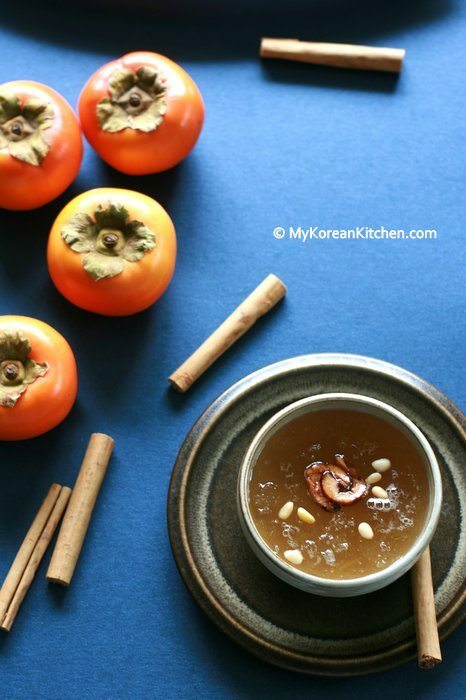 Can I make an effective tea with fresh persimmon? My favourite drink my best friend’s mom made for us as kids! I think it will make my pregnancy nausea go away & I will feel better. Thank you for the recipe. If I don’t have cinnamon sticks, can I just use cinnamon powder? I hope your cinnamon punch turns out well. 🙂 Enjoy! May I know why you have to boil ginger and cinnamon on separate pots? They both need 40 minutes to boil. So why not combine them? I have been eating Korean since I was a child but just had this drink for the first time today (still in the restaurant now) and wanted to know how to make it. Thanks! 🙂 You must be very keen to make this drink. Hope you get to try my recipe! It’s still pretty cold here, but the cold drink looks really good. I prefer sujeongga icy cold. Come to think of it, I don’t think I’ve ever had it warm or hot. 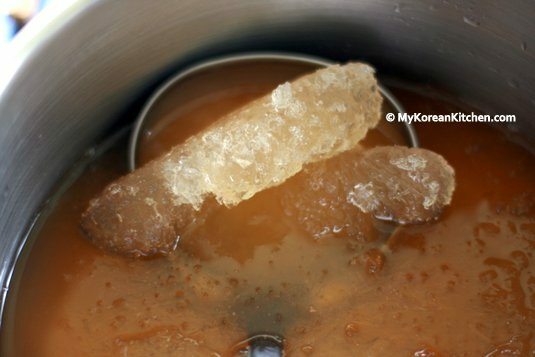 Great recipe for a traditional Korean drink Sue! What a wonderful, unusual drink! It does look perfect for cold days at first, but since you say it can be drunk cold too, I can easily imagine it even in the summer. 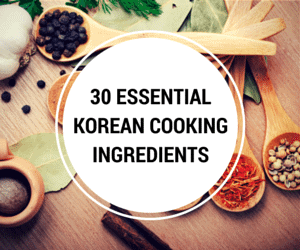 I love Korean cuisine for its addictive combination of sweet and hot flavours, I cook it quite often (ok, let’s say I try to cook it 😉 ), so I am delighted to discover your inspiring, beautiful blog. I think it can be drunk all year around. (Any excuse will do. :D) Thanks for stopping by Sissi! Oh I love the sweet rice drink! I never thought of cinnamon as Korean ingredient (just like it’s not in Japanese cuisine). How interesting and I love to taste this!